Replacement car keys Grand Rapids MI in a hurry. A1 Locksmith Service has 1-2 hour turnaround to replace lost car keys! to you to for car key replacement. Two hour turnaround from the time you order the key. for a car key replacement quote! NOTE; If your keys are locked in your car, you shouldn't need to replace your car key--we'll come open the car without a key! If however, the keys are locked in the trunk, (due to difficulty of opening a trunk without a key) it will probably be less expensive to have us create a duplicate mechanical key to open the trunk. The price will depend of what type of key you have! Most newer cars are equipped with transponder keys. (These keys have a transponder chip embedded into the head of the key). Transponder keys were created to eliminate car theft. If anyone tries to start your car without the transponder key, the car will shut down and some will become completely immobilized. When we create replacement car keys for your car (from the car's VIN - Vehicle ID #), the new key needs to be programmed to your vehicle and the car's computer to allow the key to work. We come to you to program the new key. Most car dealers only keep these codes for 10 years. Even if they have your code, they will require (in the case of a transponder key) that you have the vehicle towed to their location to program the key to the vehicle. GM vehicles (Buick, Cadillac, Chevrolet, GMC, Oldsmobile & Pontiac, approximately 1990 - 1996) were created with a small black transistor on the blade of the key. These keys are referred to as VATS keys. Since many vehicles of this age are still on the road, this is the third type of key could have. 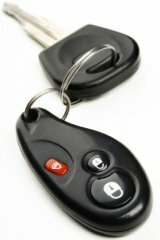 If you have lost or need a replacement key fob or car key remote and need more information about getting a new one! Serving all Grand Rapids neighborhoods, Ada, Cascade, Caledonia, Comstock Park, Kentwood, East Grand Rapids, Grandville, Wyoming & Walker.